even noticed Flessers in their tiny little town. In fact you can just end up passing right through the little country town, but if you hang around a little, you’ll find gems like I did when Sandi took Dan and I along with the kids there. It was a long drive, almost two hours if I count right and I was tired. Well actually Sandi said they were the best she’d ever tasted and they even drove occasionally to get some although it was a really long drive from where they were. We got out of the car and instantly walked into the bakery. It was a typical small country bakery and Sandi marched towards its best seller and ordered away. We ordered three and when Dan tasted it, he ordered five. It was a pity I did not take photos of the shop, I was tired and forgot, and just wanted to get something to eat and drink. What is a Vanilla Slice? 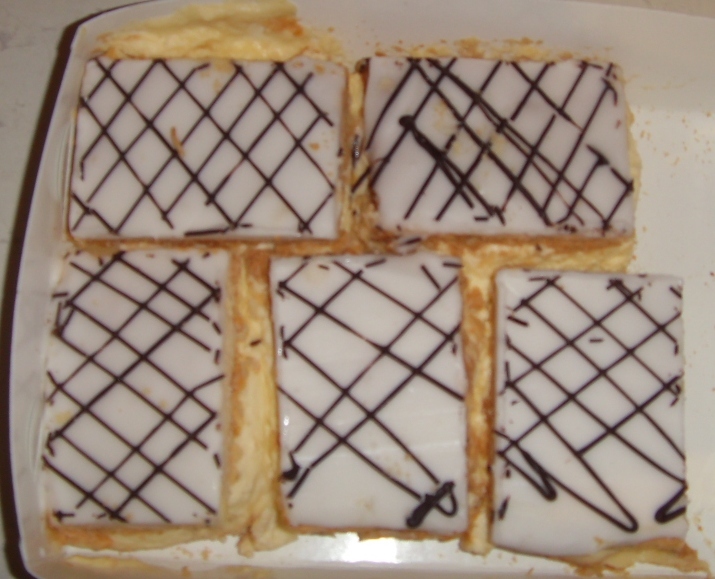 Vanilla Slice is similar to a French Mille Feuille, but in Australia and in the United Kingdom, it does not have as many layers and different fillings. 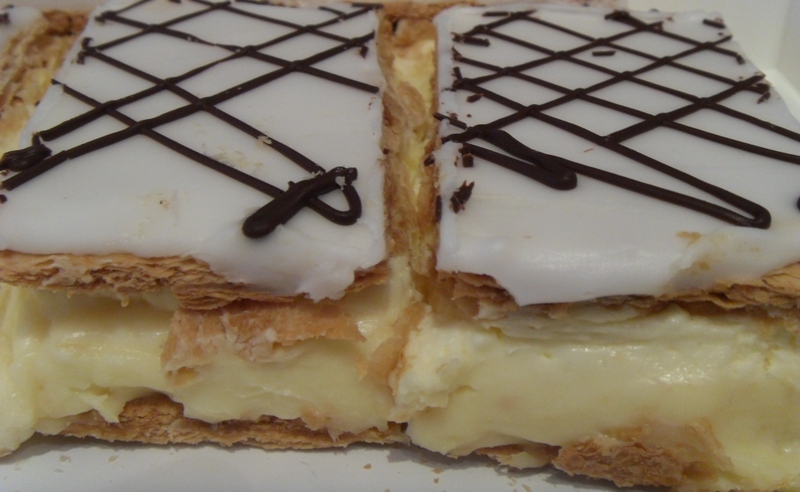 In Australia, a Vanilla Slice is two layers of Puff Pastry sandwiched with a creamy custard, and dusted with icing or sometimes with a Glace Icing and combed with melted chocolate. Sounds quite boring but not Flesser’s. I am so so with Vanilla slice, Flesser’s was really out of this world. It had the most tastiest Crème Patissiere and not yucky gooey custard and it was not topped with a normal glace. It was also not sickeningly sweet. 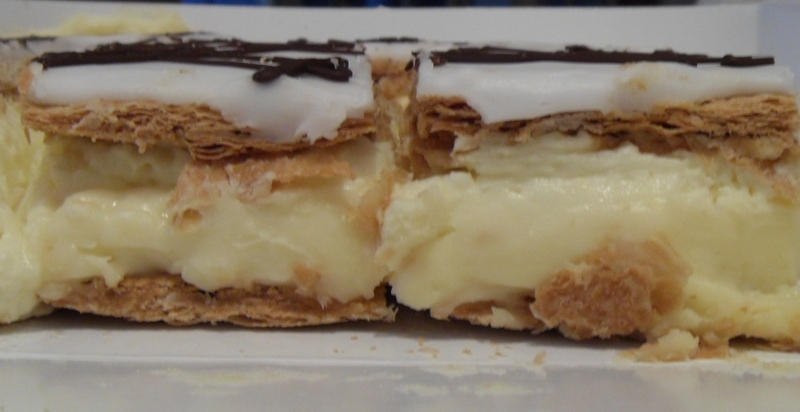 I felt Flesser’s topped their Vanilla Slice with a thin layer of fondant and , then drizzled chocolate all over it. Simple yet decadent. It was a mouthful of sheer indulgence. Although I was sick, I did enjoy this thoroughly. Flesser’s sell excellent meat pies and breads, sticky breads and buns and little cakes and even ginger bread. Again I wish I took photos of it. Hope you enjoy the photos and if you are ever in the vicinity do make a beeline to Flesser’s. It may be far out, but it has become quite an institution. They have such lovely staff too, happy and sweet and passionate about their Vanilla Slice. I will do a class on Vanilla Slice real soon. Dan and I were on the way to Fiji via Sydney Airport and we got hungry and came across this Chinese Restaurant. It was actually rather crowded as well. So we walked in and I was in the mood for Dim Sum, but I have this rule when I fly.. I try to fly on a empty to light stomach, and Fiji being 4 hours away made that rule necessary. Thing is I was sick the previous day and sat at the hotel all the time and only had crackers, Vegemite and tea. So I was kind of hungry. Anyhow, the restaurant was run by Indonesian Chinese so it was quite interesting to see how different their food would be. I have never tasted Indonesian cooked Chinese food so it was going to be an experience. Menu was simple but not cheap. The fact that this being an airport could have had something to do with that. One last meal and get slapped with a large bill. So we chose, I took a Chicken Spring Roll and a soup as by now I had totally no voice, and was whispering most of the time. Dan ordered a Fried Rice and I was quite shocked by the price. Ordinarily I would have never ordered rice, so I would not have even noticed the fried rice section. But again I was interested to see what was in a scoop of AUD20 Fried Rice. My Soup came, ordinary, well simple just the way I wanted it. Clear Soup with vegetables but somehow there was Broccoli in the photo in the menu but none appeared in the soup. That is really a pet hate with me. You show something in a photo, then you make sure it is there or not tell me. 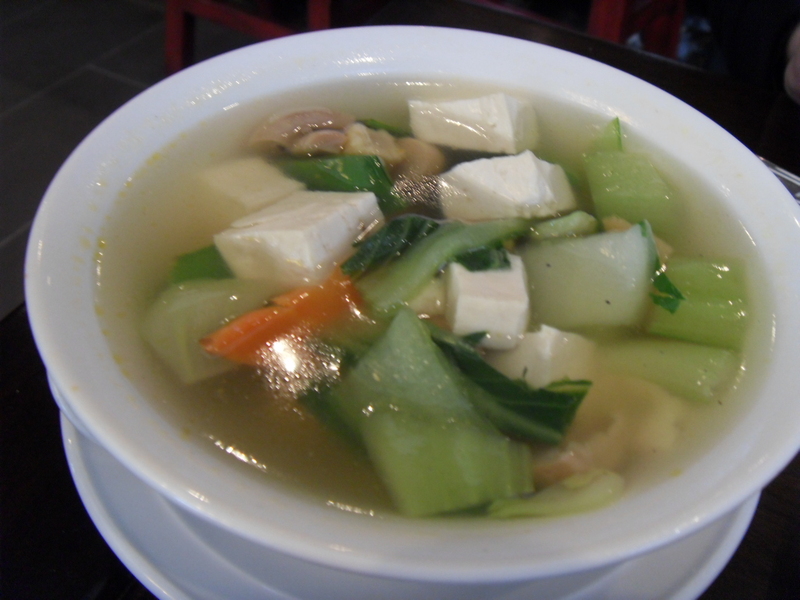 Still I liked my soup, it was comforting for a voiceless person like me. It was made of rich stock, so that was another plus. The rice came and still curious to know how an AUD20 fried rice looked like, I took a fork and scooped up some rice. Simple tasting fried rice, good quality rice, but then the next mouthful told me why it was that price. It was laden with fresh scallops and fresh prawns along with a good amount of fish roe. As a Cook I always like to find out why some places can sell their simple foods at a remium price and so today I found out why this AUD20 Fried Rice was available. 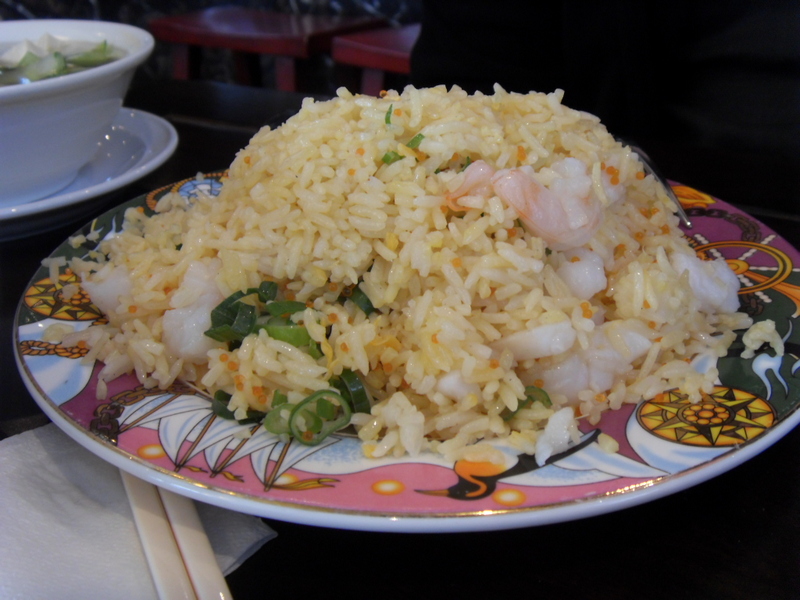 Nothing beats Fresh Scallops and Fresh Prawns in fried rice. And this is coming from someone who dislikes seafood. The bite, the taste, the flavor was simply out of this world for me. I would like to do the same when I get back just for the sake of doing so. This is something I must try at my next dinner party. This was as good as the Crab Meat Fried Rice I had at Erawan. 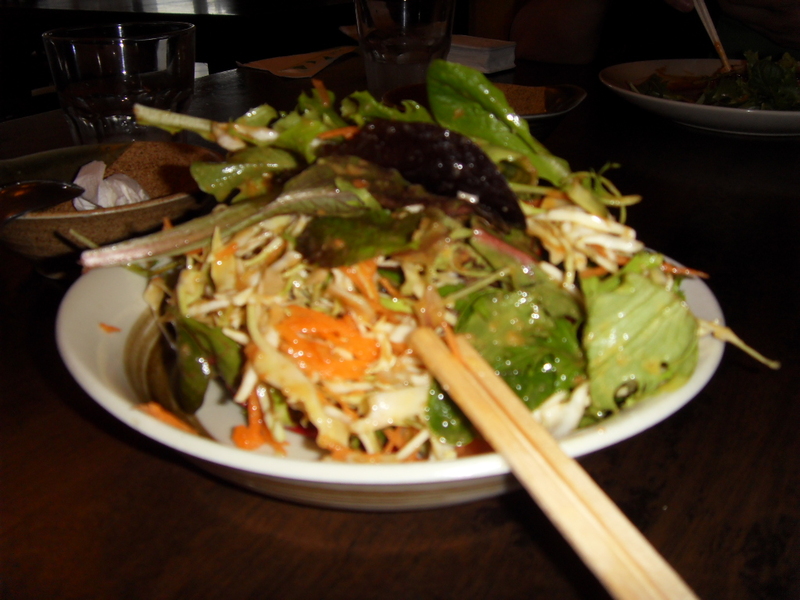 The use of fresh products often means you need not use much ingredients to enhance your foods. And when I say Fresh products, I mean products that are not frozen but most probably bought and used on the day. This adds so body and flavor to your dish. Frozen foods while convenient, is somehow lacking of this added goodness. Then I remembered we ordered Chicken Spring Rolls. I was going to cancel it but before I could say cancel, the supervisor ran into the kitchen and in a few minutes the spring rolls came out. It was nice, nice as it is as I do not like dunking my foods into sauce and when I did taste the sauce, it was quite yukky! 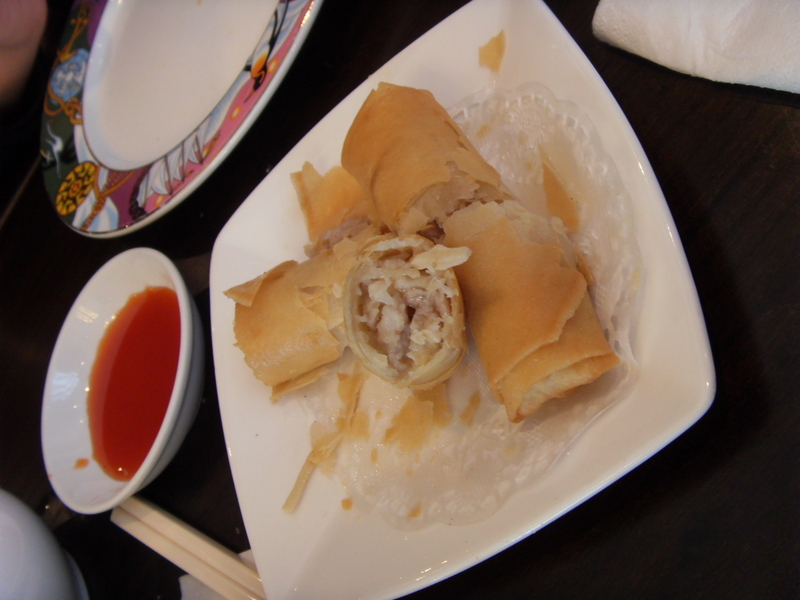 The Spring Roll was full of chicken and I believe finely sliced bamboo pith. now on a good day I would have gotten quite sick but somehow my body must have changed. Note the yucky red sauce in the photo. I could not believe this sauce was served in a restaurant that just served me AUD20 Fried Rice. It was just shocking. Anyhow it was time to leave, and if you note I do not have the name of the restaurant. I cannot even find it online for some reason. So if anyone out there reads it and knows the name of the restaurant, do tell me please. I was satisfied, we boarded to plane to Fiji, for our next food and travel endeavor. After an all day thingy in Brisbane City while waiting for my cousin Kevin and his wonderful wife Suzie to finish work, Dan and I walked around Brisbane’s Queen Street and I think we both found it rather uneventful. Nothing tempted us to spend unlike Melbourne, the food, well we were quite full because we had or at least he had a heavy breakfast courtesy of Sandi. Sandi spoils us I should say. Anyhow as usual we got our roads mixed up and so we had to race up the street and I was actually getting hot under the collar, close to sweaty, when I chanced upon Suzie sitting on a bench waiting for Kevin. What a relief! So we drove around and I really did not know what to expect with German food in Australia as if you have read earlier my encounter with a German Restaurant in PJ was kind of so so, and it was not the first time as well that I had German so keeping my fingers crossed and as positive as I could be we finally reached the place. Parking was a bit of a problem but Kevin managed a la true Malaysian style. 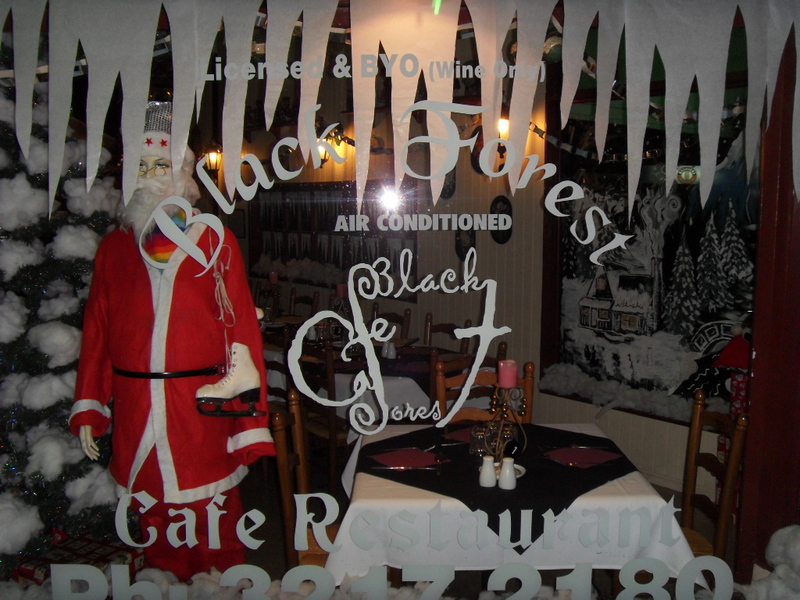 Black Forest German Restaurant was a sight to behold with all its Christmas Decorations. Then I remembered Christmas in July. The whole place was a picture book of Christmasness, complete with Santa Claus and angels and the works. The cosiness gave a very family feel to the place, it was like a home with a very big family waiting to get together. Black Forest is family run, so don’t be surprised to see the owners wife who is Asian, serving you garbed in a German costume. So we were seated and I noticed there was a booking for a big group of about 20 people. I was told you need to book even on a normal day or you won’t get a place. So there you go, as over the top as it looks and sounds on their website, Black Forest rules! So we ordered our drinks, all took lemon lime bitter for some reason and it was a good size I might add instead of little miniscule glasses that finish after two gulps. 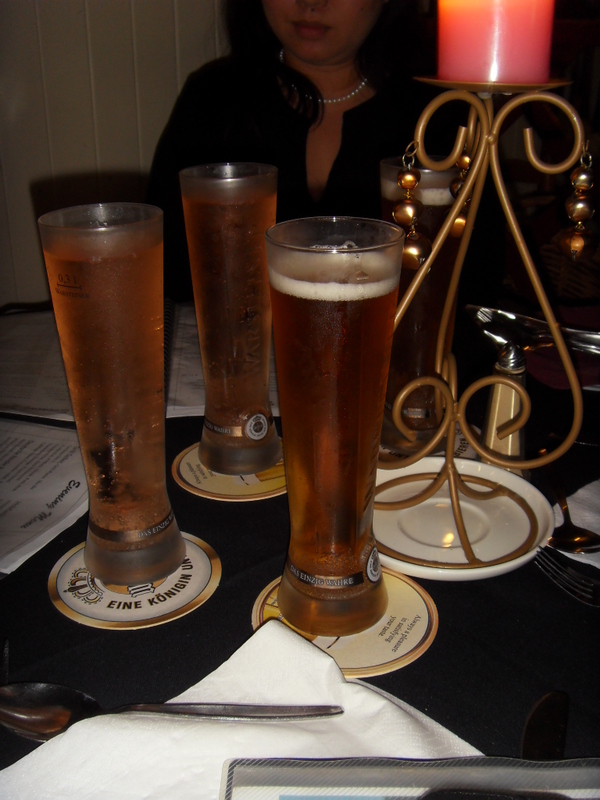 I did have a tough time on what to choose as I peeked at the next table and realized portions were rather big. So I let the three of them choose and so I made my choice after that. It was non sausage like the rest. 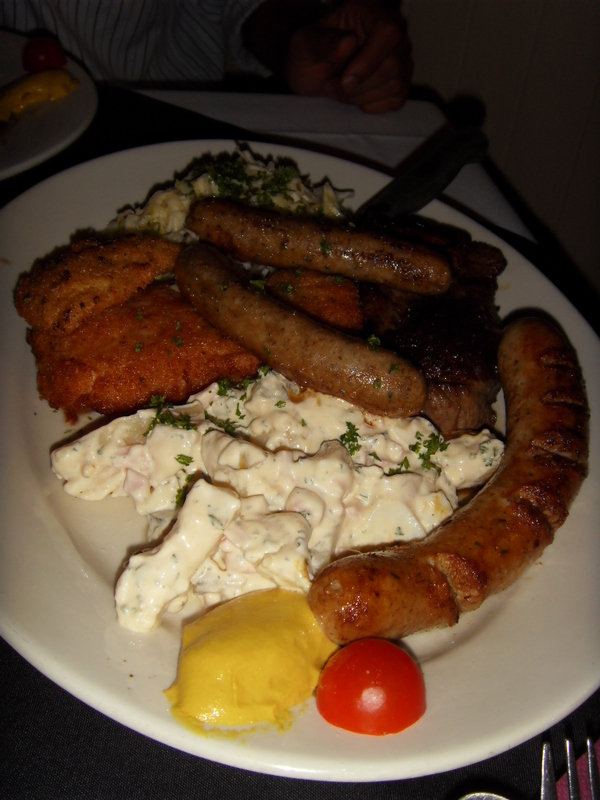 To describe these three large plates of sausages and pork slices is not easy, they were all nice, and I still had a sensitive tongue. The sausages unlike what I have tasted in Malaysia tended to be smoother and more solid. When I say solid I mean it was meaty and heavy, and extremely tasty. 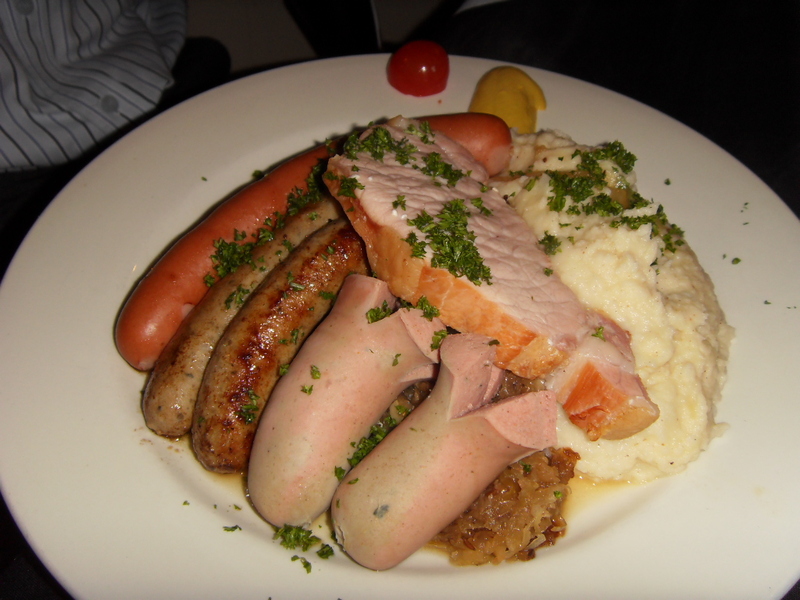 I believe Dan and Kevin had the Nuernberger Rostbratwuerstchen which as you can see was a pretty big plate of all things sausages. I did like the combination of sausages as it was a nice color and not too over fried as I have had sometimes. The mash potatoes were nice and 100% not the boxed kind. Suzie had if I remember well the Grill Teller which had a piece of steak, pork chop, chicken chop, sausages and it was served with a large amount of potato salad. She is eating for two by the way. I wish I was hungrier, as I love sausages and could have eaten more. The mix of meats were tasty flavorsome, and most importantly they did not taste the same. 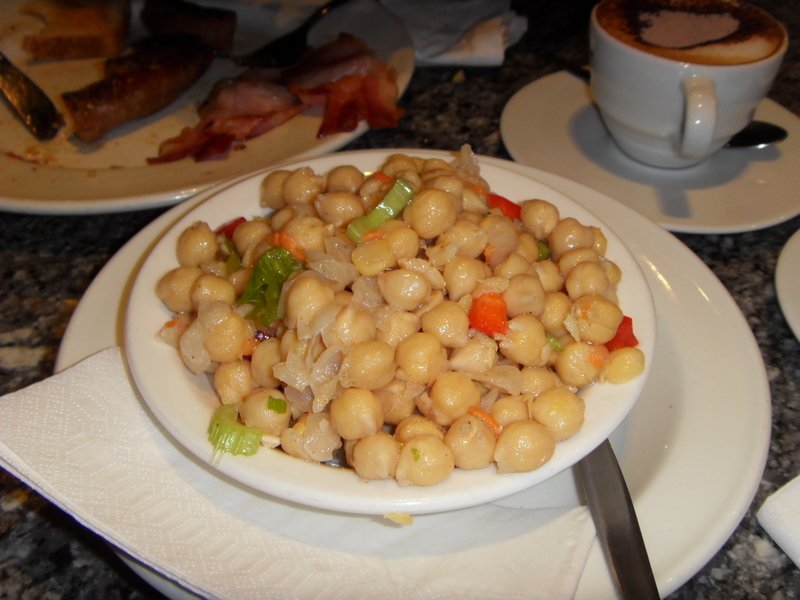 The potato salad was good because they used the correct pontiac potatoes and not the usual mundane kinds we get here. As for my dish, for the life of me I cannot remember what it was, simply because I wanted to be different. 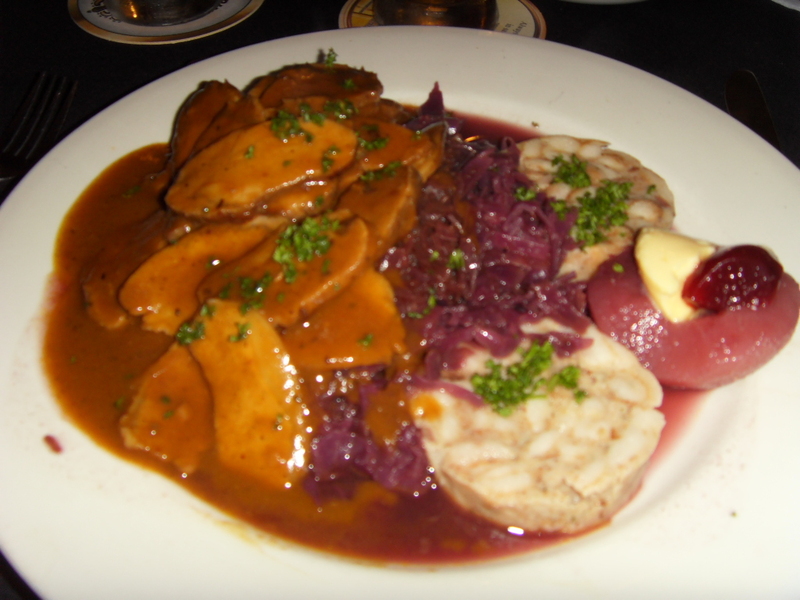 But mine came with a large amount of pork slices, with a sauce which I thought was rather ordinary but the pear cooked in wine with cranberry and with a dollop of crème fraiche. And for the carbos on my unlike the others who had potatoes I had two slices of stuffing which had bits of chestnuts and herbs. I thought that was a good choice. For my vegetables I had purple cabbage which was sautéed. This gave the whole dish a very nice color combination. I ate all my food, because it looked and tasted nice. The others did not… pity I could have had more sausages. For Dessert, we decided on one Dessert and it was Heavenly Delight. 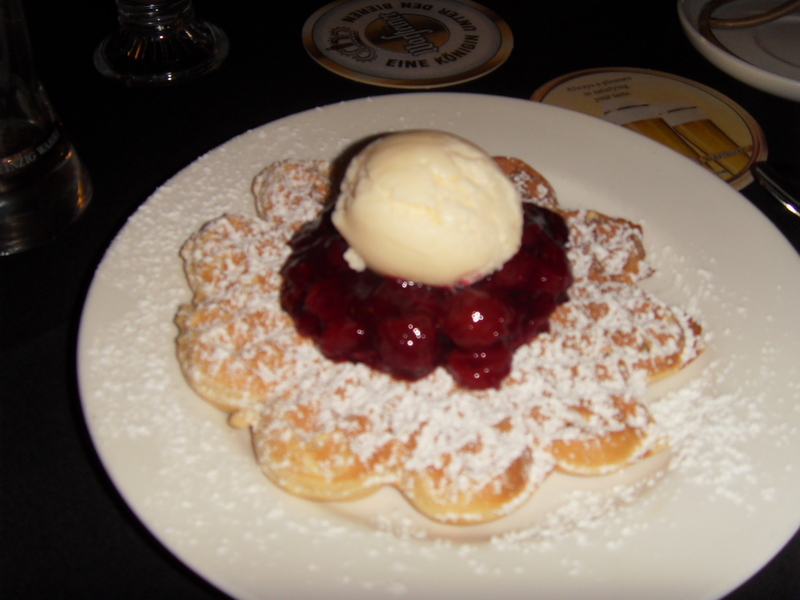 It was a waffle kind of base served with morello cherries and a dollop of ice cream. I think there should have been a hint of Kirsch to give it a bit more oomph. I did not eat much of the dessert as the sourness was stinging sensitive tongue. 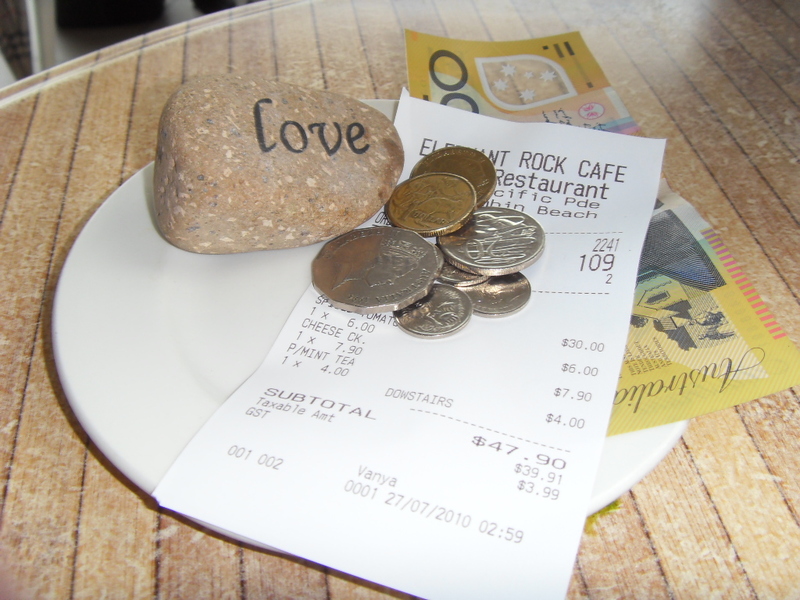 The bill…AUD132. I thought it was not too bad actually because certainly if we had it here in Malaysia it would have been a lot more. I’ve always been a fan for lightly tasting food and this hit the spot. Nothing was overly spiced or herbed, it was just nice. I would like to go to Black Forest again when I go there next, this time on a totally empty stomach! Tagged Black Forest German Cafe Restaurant, Brisbane, Gladstone Road, Good German Food. We chanced upon Elephant Rock Café quite by accident. Only because it rained and there was no where to take shade except this unassuming little restaurant in front of Currumbin Beach. In fact at first glance you would not think it was much of a place because it was not crowded as it was way past lunch time. Anyhow we plodded in all soggy and wet and I caught sight of their pastries and cakes and what caught my eye instantly was their Tofu Cheese Cake. Now I have always like Tofu Cheese Cake and have yet to find one that was good. I am talking of a yearning that dates back to Oprah Winfrey’s Cookbook in 1993 which featured this recipe but I never ever tried it. I have had Tofu Cheesecake before and it was catastrophic! Not once, not twice, but many a time. But I decided to take the chance today. Ok before I get started, I have to say there was no signboard except for the little blackboard, now this made me raise my eyebrows a little bit wondering if this cafe was an ordinary cafe with a little bit of thrills and frills thrown in. Well, NEVER JUDGE A BOOK BY ITS COVER! 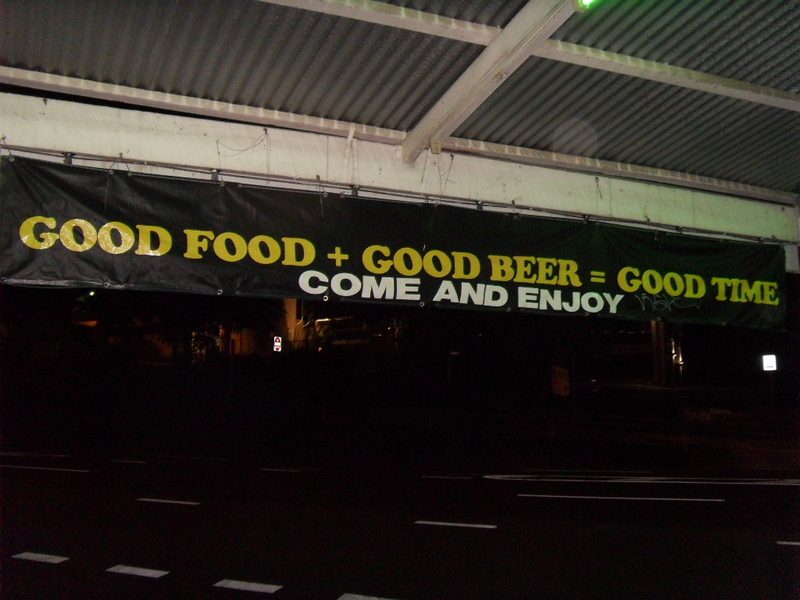 or in this case NEVER JUDGE A RESTAURANT JUST BECAUSE IT DOES NOT HAVE A SIGNBOARD! Dan of course said he was not hungry, but that as usual is always left to be seen. In the end he ordered a Spicy Tomato Juice, with the Menu of the day which was a Trevalla with potatoes and vegetables with a tangy creamy sauce topped with a tomato salsa. Now I really did not know what to expect as while sitting inside Elephant Rock Café and having the Owner and her very beautiful daughter sitting in front of you, you realize this place is a nice hangout on a lazy afternoon. Perfect for the Ladida kind! In fact the Owner and her Beautiful Daughter and their friends that day with the cute baby did look the perfect picture of the Ladida Kind! Then looking at the menu which you can actually find on their website, you realize that this is actually quite a nice place which features very modern Australian Cuisine, something that I had yet to try, and in fact all through our holiday, we never ever had the chance to do so again. 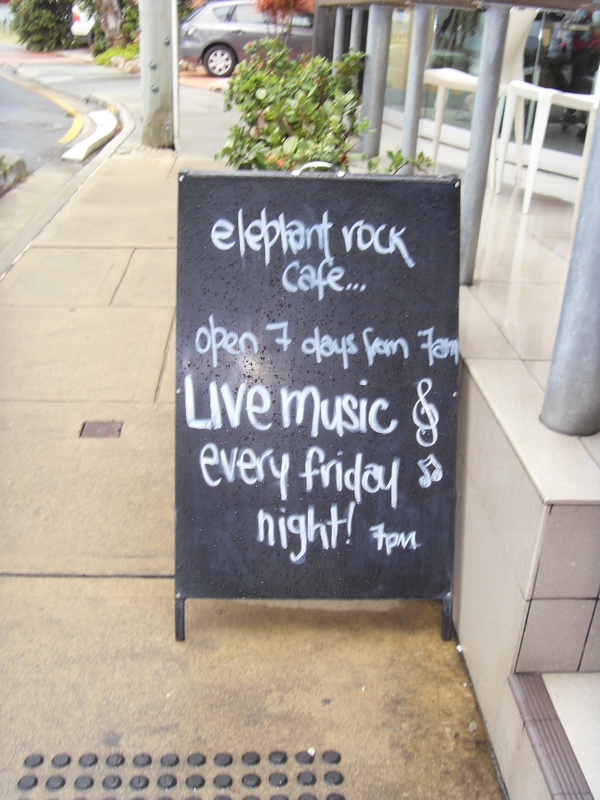 I never hung out at Elephant Rock when I lived on the Gold Coast because we always hung out at Surfers Paradise. But somehow in the last ten years, the more happening places seem to be moving south. 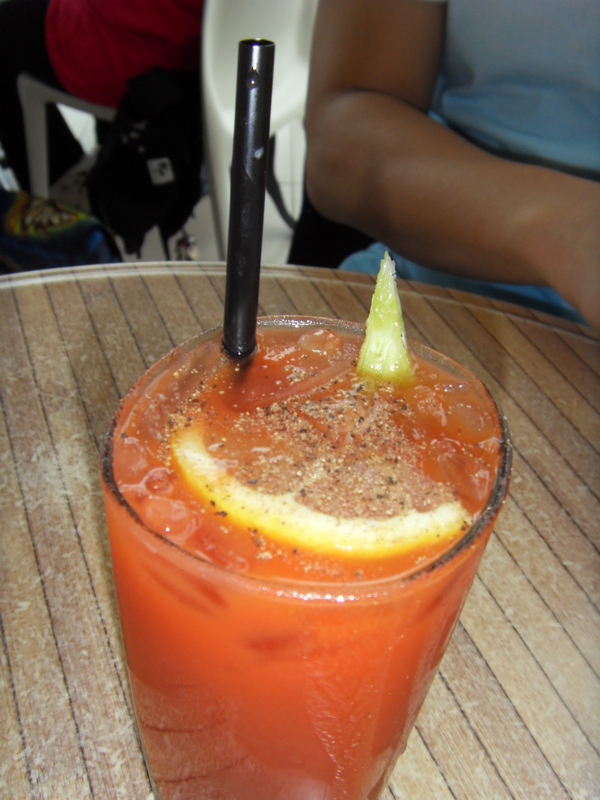 The Spicy Tomato Juice was simply divine. It was different and with the black pepper sprinkled over it, it went down your throat with a funny feel, that was refreshing yet heaty. It was a cold beverage but suitable for a cold wet day. I had a pot of tea because I was wet and cold and was having dessert. 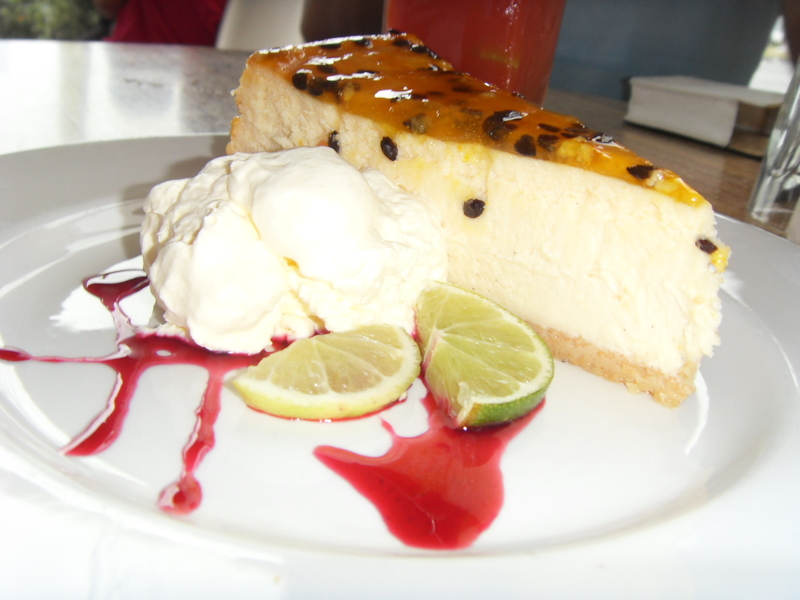 My Tofu Cheese Cake was just simply scrumptious. It was like satin and absolutely no taste of tofu whatsoever, it was milky but in a lightish soy kind of way, and being a person who is only so so with cheesecake, this was really nice. Comforting, light and in a modern setting. I could have had another piece, but weighty issues did not permit me. But now looking at it I wish I did. Now Dan’s fish was really out of this world. The taste was a mixture of sour, sweet, tangy, and you could distinctly taste the ingredients in the dressing and it went superbly with the potatoes and the vegetables. 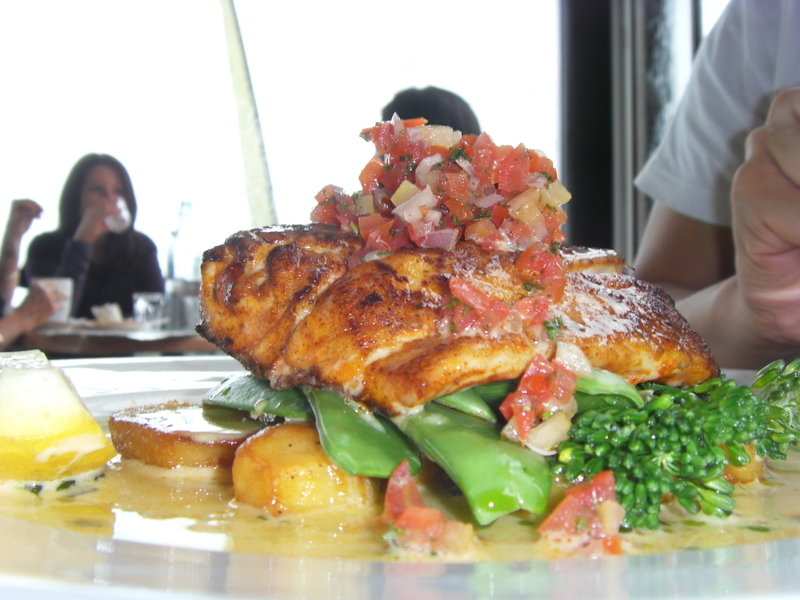 The fish….. coming from a non fish eater was perfect as the picture. 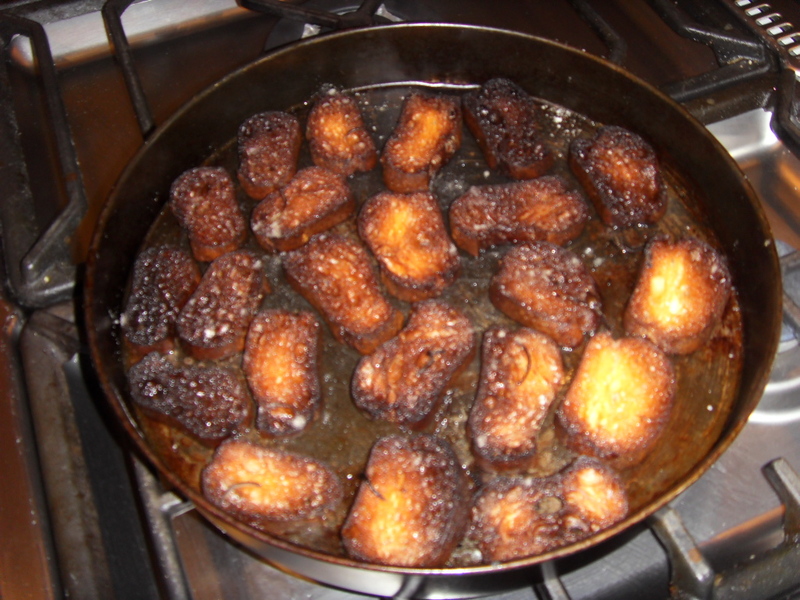 It was perfectly cooked, just a slight bit underdone as it should be crispy on the outside, wet and tasty on the inside. When you eat this fish you will know what a Trevalla tastes like. In fact if the chef cooked ten different types of fish exactly the same way, you would still be able to distinctly tastes the ten different flavors of each fish. I believe the chef was that talented. 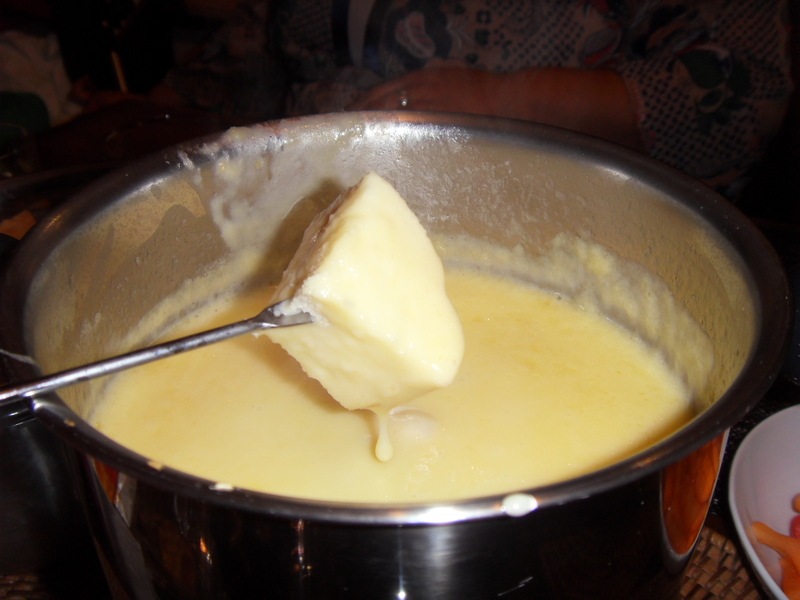 And the sauce which was divinely satiny similar to a lemon Beurre Blanc, but with a tinge of something I could not get my finger on. Perhaps Dan was eating too fast and I did not have a chance to taste it enough. The gelling of Eastern and Western Flavors was done so naturally it made fusion cuisine look really look passé. In fact the whole menu was like a perfect combination of flavors from the two different worlds. Kudos to the chef of Elephant Rock Café. Kudos to the Owner for creating such a scrumptious little place. And finally the bill presented with love, now who can argue when something is so lovingly presented. Do check out the website as it gives you a whole picture and trust me it’s all true! 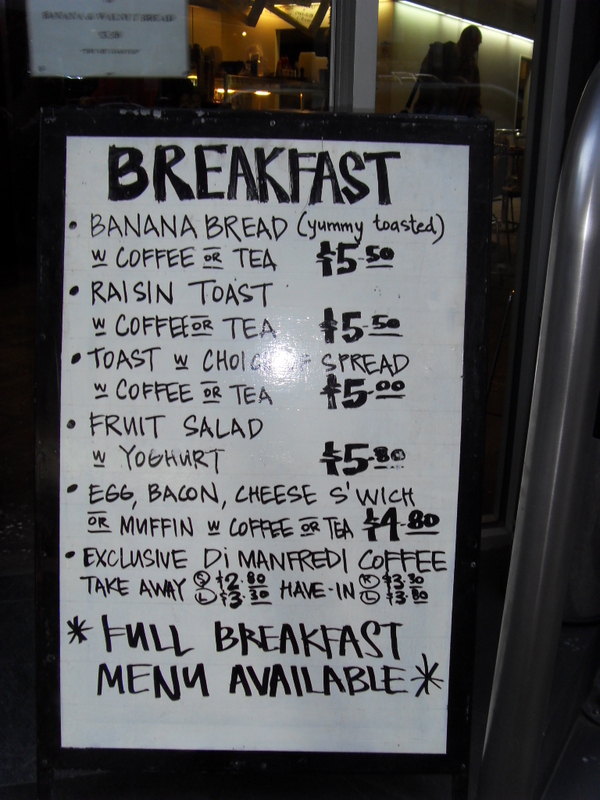 I will 100% go back to Elephant Rock Café when I go back to the Gold Coast next year. I would describe this restaurant as a very well thought of restaurant which will give bigger names a run for its money in the near future. Elephant Rock Café has far to go. It should be somewhere more major to take on the big guys! Thumbs up Elephant Rock Café! It was a horrible day on the Gold Coast as it rained non stop from the night before. We woke up to the loud pitter patter of rain and it rained so much that the billabongs in Vera’s yard (a very large yard) was to its brim. It was no fun because we could not go out and pluck oranges and mandarins for juicing as it was just too wet. It was so wet we had to cancel our trip to Movie World that day. So after our activity at the kindergarten Ana, Tomislav and Maia go to, Vera hurried us and took us for lunch before driving up to Springfield Lakes. 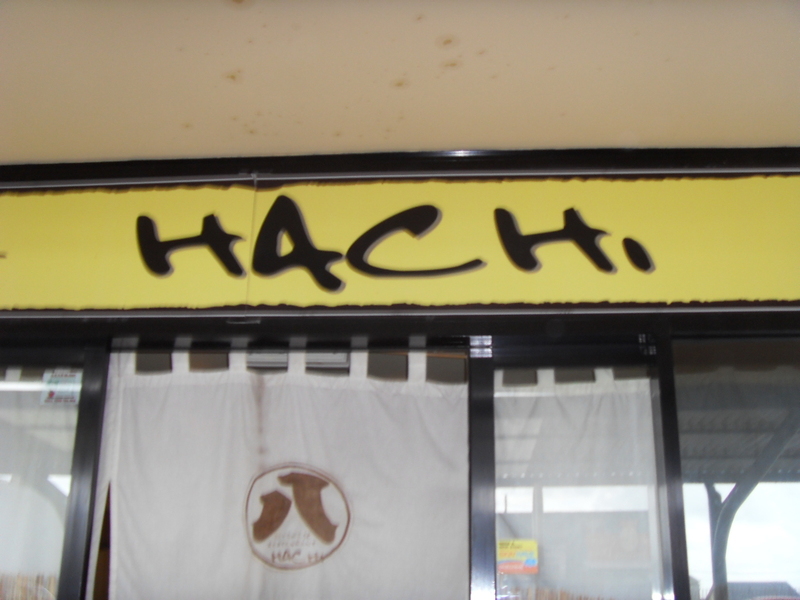 So she suggested Hachi, which was up the road and through the rain we found a park and entered this rather out of the way Japanese Restaurant which seemed to have a good following of the locals who were all there waiting and ordering their food. We went through the menu and so we placed our orders, one thing that caught my eye was Agedashi Cheese. We had no clue what it would taste like now how it would look, so that was the good part of it all. I ordered a salad, Dan ordered a Salmon and Vera ordered Ginger Pork. The restaurant was filling up something I thought was rather strange as it was a working day and mainly it was locals having Japanese on a rather cold late morning. Miso soup came, and I never touch Miso Soup as it gives me cold sweat. So Agedashi Cheese comes and we were quite shocked to see how it was served. 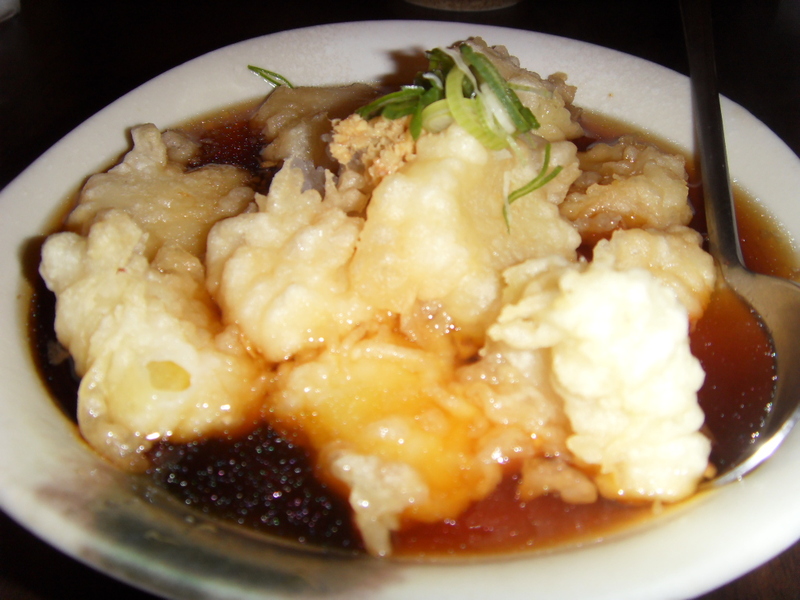 Unlike Agedashi Tofu which is usually half immersed into the soy bonito soup, this was like a soup. We were all a bit apprehensive about the taste but a mouthful of it told us otherwise. It was nice. It was a strange kind of nice, because the fried cheese actually blended well with the soup. 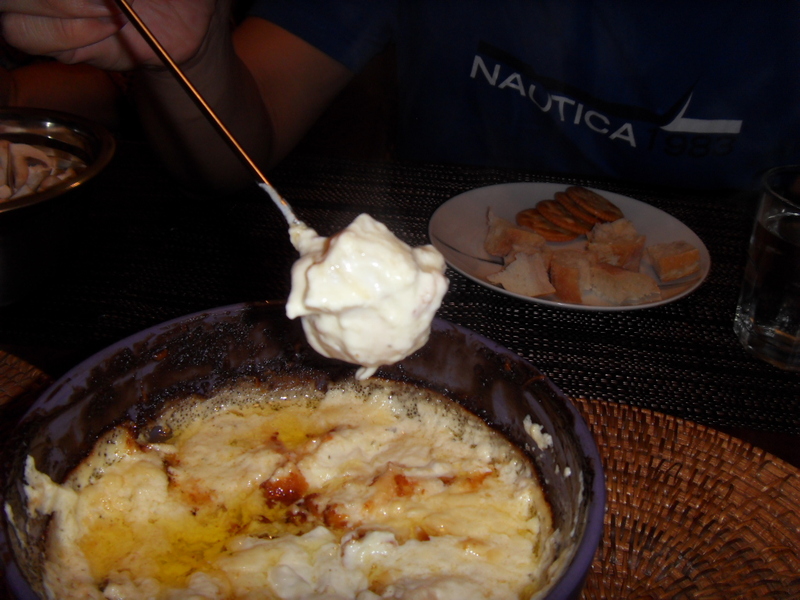 It had a nice balance of salt and sweet and the creamy tang the mozzarella cheese had. I guess the way it was served was left to be desired, but it was certainly something I would try again. Vera’s Ginger Pork was nice, rather gingerly but nice on a cold rainy day. 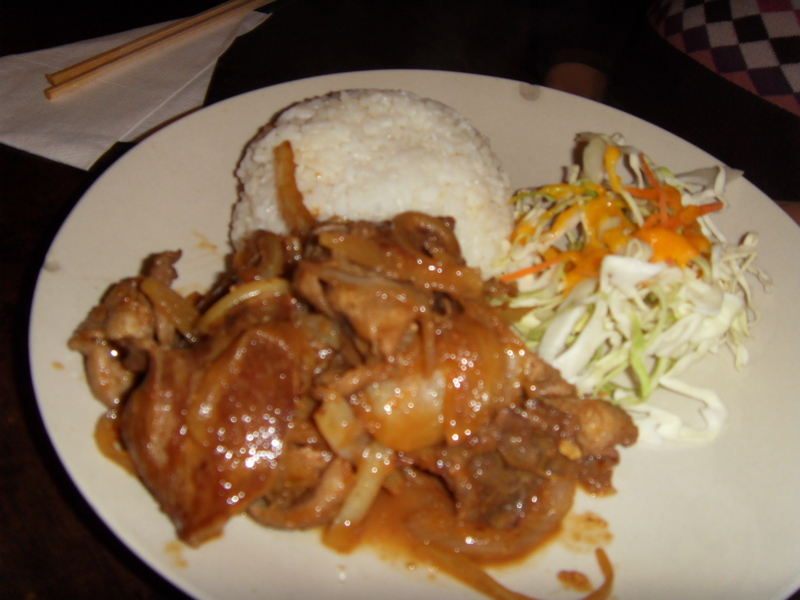 It had to be eaten with rice, and since it was part of the set, it came with the works. I would not say it was the finest Japanese Food, but it was more so in the comfort food category. Something that may not look so nice but still can hit the right taste buds. That was how I would describe the Ginger Pork. 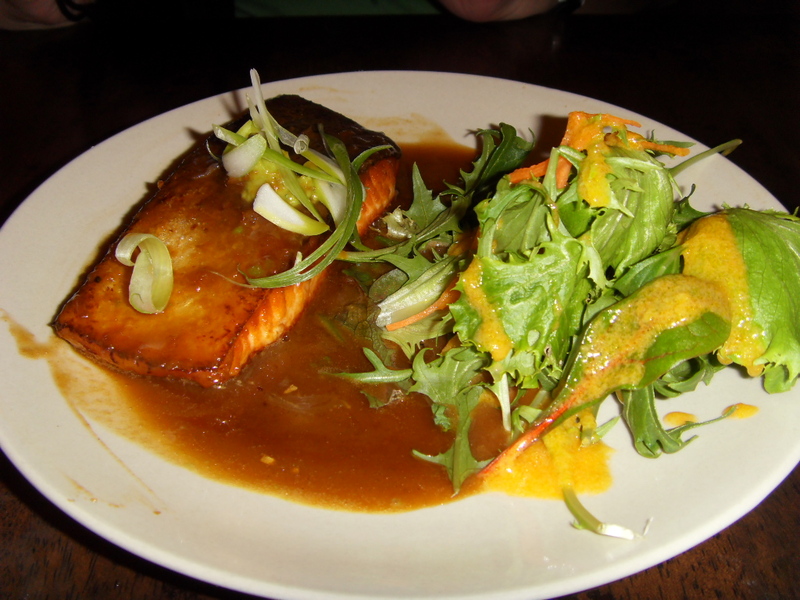 As for Dan’s fish, it tasted nice, obviously it was frozen salmon so of course the taste not the best, but with the sauce, and the accompaniments it had a nice taste to it. I am biased here because I do not really like fish especially the frozen kind. For the price we paid in the end, it was not too bad, all our food was under AUD50. So if you’re on the Gold Coast, out near Palm Beach, and you come across this unassuming restaurant, just walk in. You’ll be surprised. I wish sometimes we had some small Japanese places like this in KL, a place that has no pretense and serves good Japanese Grub. On our first day in Melbourne, my best Gal Cass was raving about Gianni’s where she always had her coffee and sometimes sandwich and even lunch. So our very first and very last breakfast in Melbourne was at Gianni’s. This review only covers the last breakfast we had there because I totally forgot to take my camera out and take photographs. Got too hungry and just gobbled up the food. The service at Gianni’s is simply wonderful, the ladies who work there know everyone by name and even if they did not customers were greeted warmly and loudly. 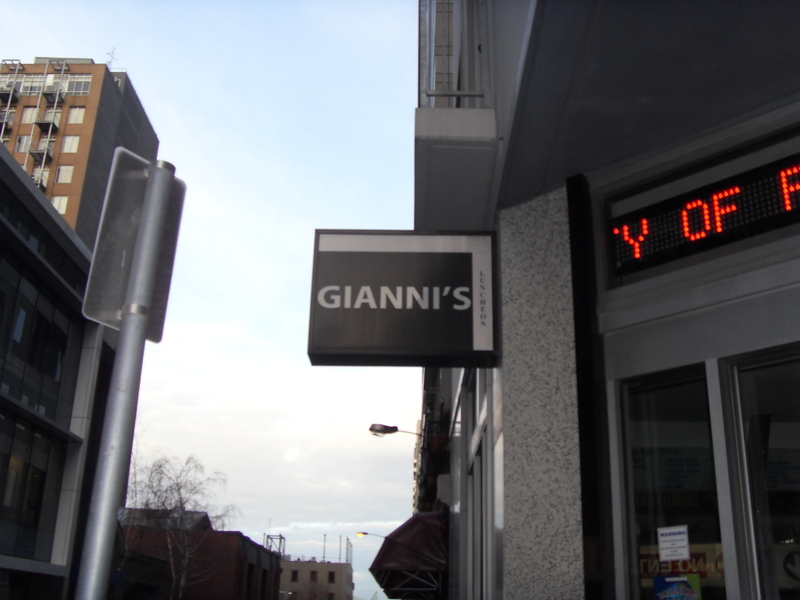 It was just the way they communicated with their customers that made the whole Gianni’s experience a memorable one. These were people who worked there and were not necessarily the owners and yet Gianni’s was theirs. This kind of feeling is never found here in our country for some reason. Even Dan and I were known there because Cass mentioned us, and as soon as we entered, they all screamed out to say welcome. Funnily enough, the people who come into Gianni’s are workmen who work on the streets to lawyers who sit there in the morning discussing their cases. This is me eavesdropping. So it all boils down to the fact that because there is no social barrier, anyone and everyone can enjoy good food at any place. Funny this can never happen in our country. So on our last day, Cass left us there and so I ordered a Roasted Vegetable with a slice of Feta Cheese ( A big slice I might add) Sandwich on Focaccia and Dan who was not hungry ordered a Big Breakfast. 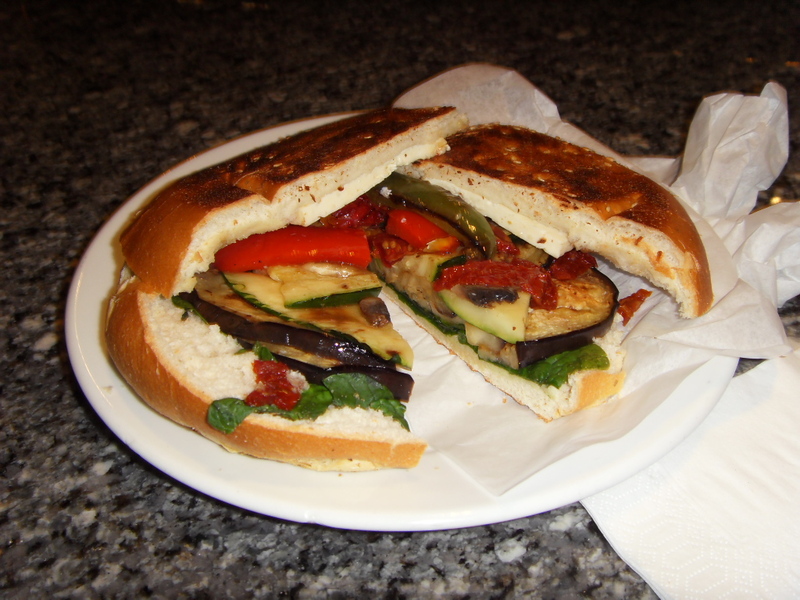 Now I was quite curious to taste a Roasted Vegetable Sandwich because frankly I have never had one before. So when our food came, it was just simply awesome taking that first bite of my sandwich. The flavors of the different roasted vegetables bursting out with the melted Feta cheese was simply indescribable. In fact Dan who ordered his Big Breakfast ate quite a bit of my sandwiches as well. The roasted vegetables gave out a taste that while still a little crunchy but a nice roasted after taste, coupled with the melting feta, it was really a taste I could not describe. Personally I could have had another sandwich because it was that nice and the fact that Dan ate some of mine as well. So far Dan and I have come to the conclusion, in Australia, you pay for things but you get good stuff. 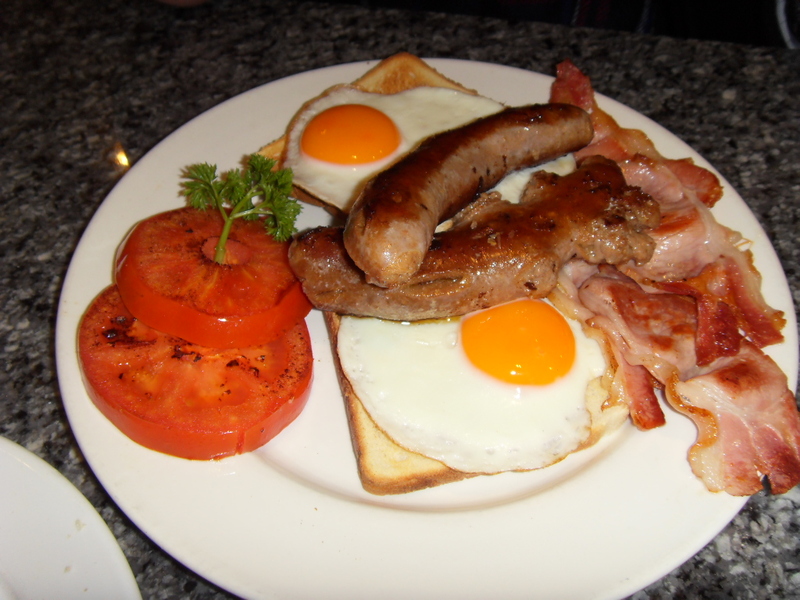 He had a big plate of brekkie consisting of two toasted tomatoes, two slices of toast, pieces and pieces of Bacon, Sausages, and two sunny side up eggs. 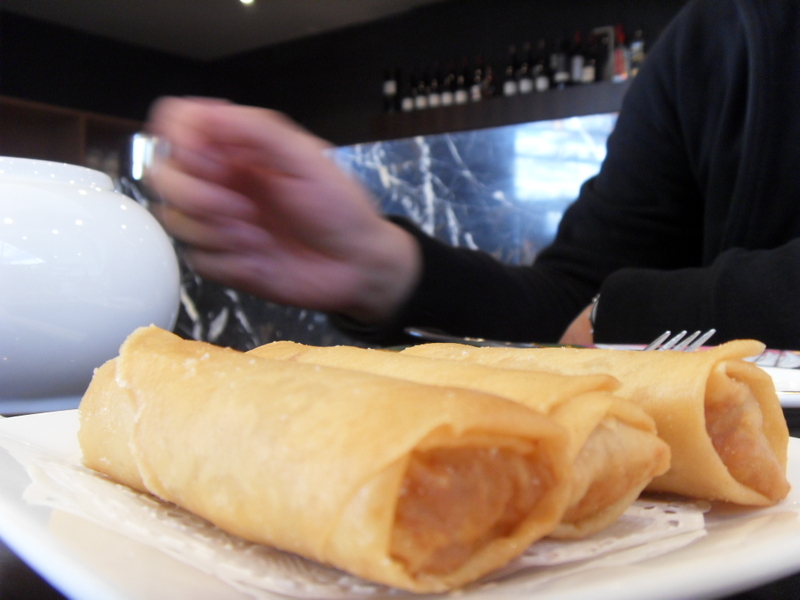 I recommend Gianni’s Luncheons to anyone who goes to Melbourne. I went there twice and it was really good and I got my money’s worth. 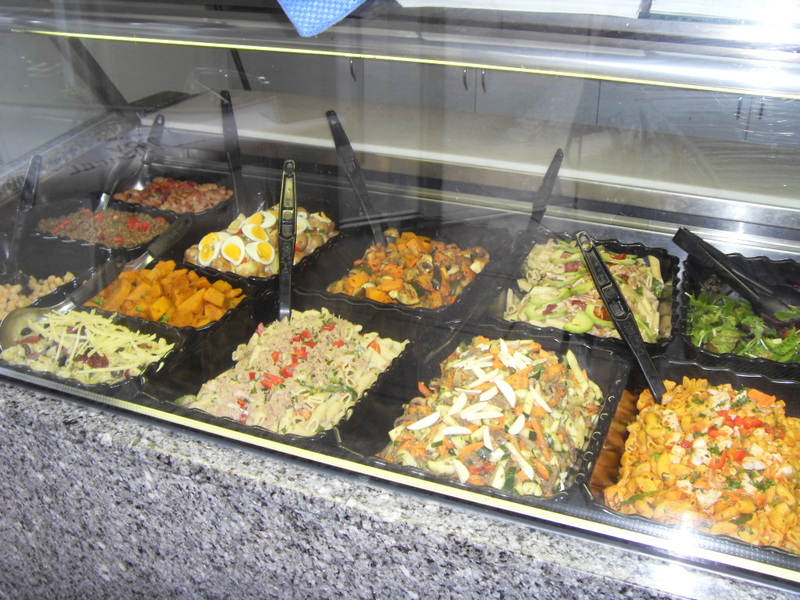 Service is impeccable, the variety of foods is really good, salads in the morning is something else and they do not have one or two types but a good variety. The coffees are excellent as well I am told by Cass. I will surely go to Gianni’s again. It would be a dream come true if I ever opened up something like Gianni’s in the future. A place where everyone knows everyone and we all come over for good value and quality grub. I have never ever thought of opening my own place till I stepped into Gianni’s. Why? Because it gave me hope that places like this can still exists in a very busy city. Some day eh! 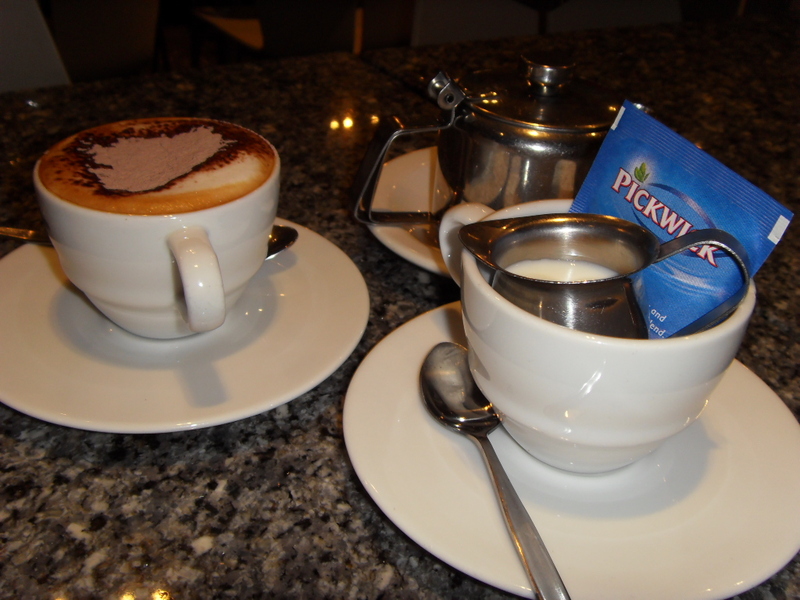 Meals we had at Springfield Lakes – Queensland. Now over the last few years of not meeting one of my dearest friends, Sandi Dai, she seems to have suddenly acquired a passion for cooking. And we are not talking cooking baby food, it seems the woman now is quite a gourmand in her own right. We had such a lot of different foods, and we’re talking about a woman was such a ladida darling in real life that entering a kitchen would have been beneath her Royal Ladidaness. This has changed thanks to kids. Now don’t you love kids, they just have a way of bringing you down a pedestal or two? But nevertheless, she would be going on about making this and that and this thatsed so good, and the kids loved it and everyone loved that. I was quiet and reserved most times listening and taking things in nice and gently. Well I was in for a shock, and the thing is she was so confident of her new found talent she actually challenged me. I just thought to my self well, we’ll see how good you are Sandi Dai!!! Well from the photos you will see, I had to keep my thoughts to my self all through our stay there because Sandi with her new ally Dan, just conjured up wonder after wonder out of her kitchen. And I might add she had a complete kitchen with everything needed as well. Eggs Benedict was one. She did keep saying on and on about making us Eggs Benedict but I just hushed it off by saying I was not hungry and silly excuses till Dan got in the picture and said, “Yes, I would like Eggs Benedict”. I pretended to say it was too heavy for me and all that jazz that most of my friends are quite used too, anyhow, in the end I felt like a Bloody Idiot! 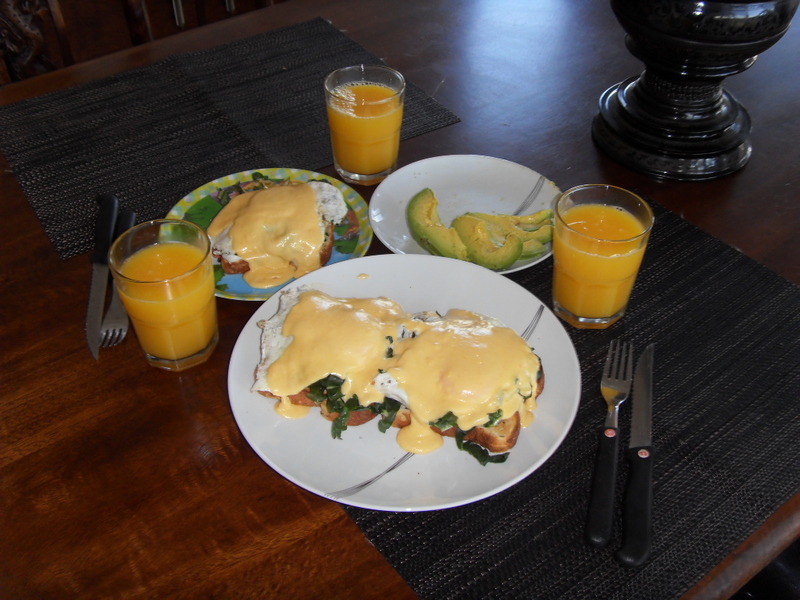 Her Eggs Benedict together with Hollandaise Sauce was just too good. And because I chose not to eat I had to settle for half an Egg Benedict on half a slice of bread. The photos show you how rich it was in color and taste. It was awesome! 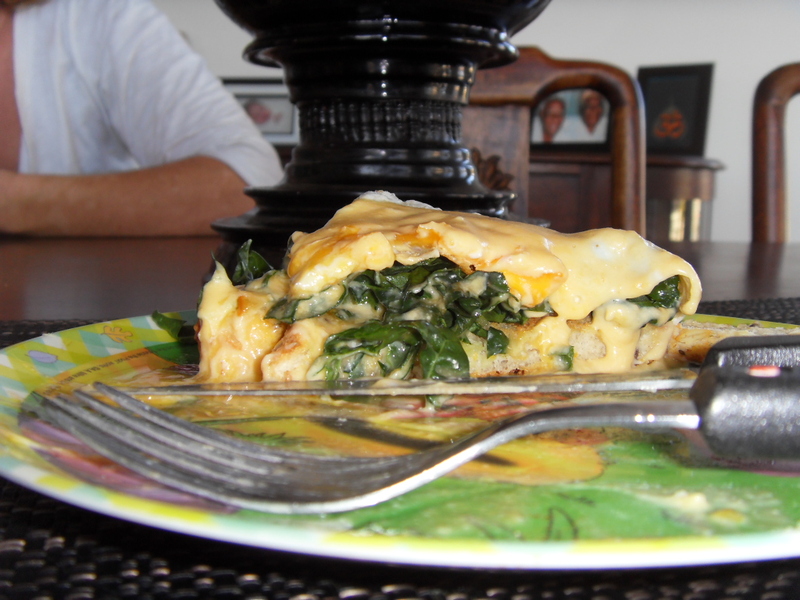 Coupled with the Silverbeet, it was simply out of this world, just enough Carbs, Protein and Vegetables. The Hollandaise Sauce was truly and simply RICH! I actually wanted more. I wanted to take the whole piece from Dan’s plate, but shame set in. 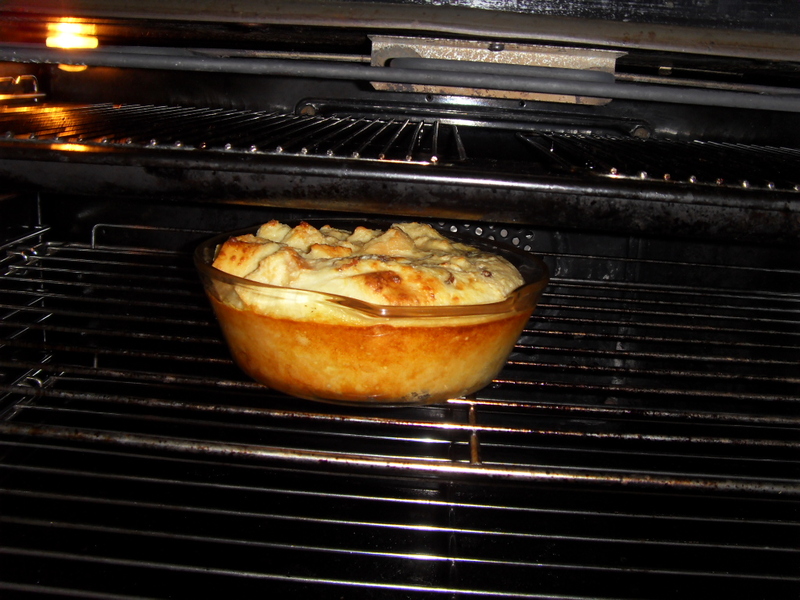 We even had Bread and Butter Pudding with light lashings of Brandy. That was thoroughly what the doctor ordered. We used up the left over French baguette, and left it to soak overnight. This was one of the things I prepared actually. Her next endeavor Cheese Fondue and Artichoke Dip. This was Dan’s idea as he has a cheese fetish so to speak. Constantly complaining how his figure has gone awry over this holiday, this was going to be one of these days. This time Dan and I had to go and get the groceries, there was five on the list but when we went to Coles that day, it became like a Food Disneyland for Dan. He just wanted to try everything, from chocolate, biscuits, cheeses, pates, twisties, you just name it he had it in the cart. I guess I was no help in this matter as well. So the five items ended up being close to 20 odd items and 2 hours later, after circling Springfield numerous times because someone did not want to listen to directions we got home. Then Sandi and Dan got into action, I did the little things of course while keeping an eye on the two “novices”, I did all the stirring and cutting up of things. Little things you know so I could at least say I contributed to this fiasco waiting to happen. Then.. right before my eyes, once everything was laden out on the table, I had to eat my words. 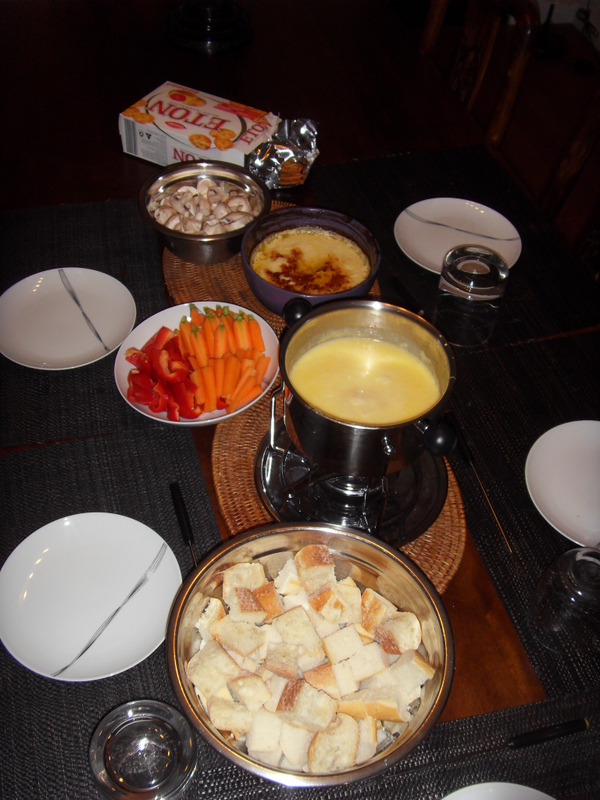 The Artichoke Dip was divine, the fondue was just as divine. I had a sensitive tongue that day, or so that was my excuse for not eating too much , but indeed had I not had my tongue being superbly sensitive I would have eaten more. Needless to say, our guests and Dan finished everything. On our final night, once again Dan got into the picture with Dan over what was to be made that day. It seems like no one asks me anything these days. So I sulked and went on to type my blogs while the Two rather not Novice Chefs went about preparing an array of dips and accompaniments. The result! Some of the dips were bought but most of them were made by Sandi and Dan, and bought versus home made clearly saw the latter way ahead of the bought products. 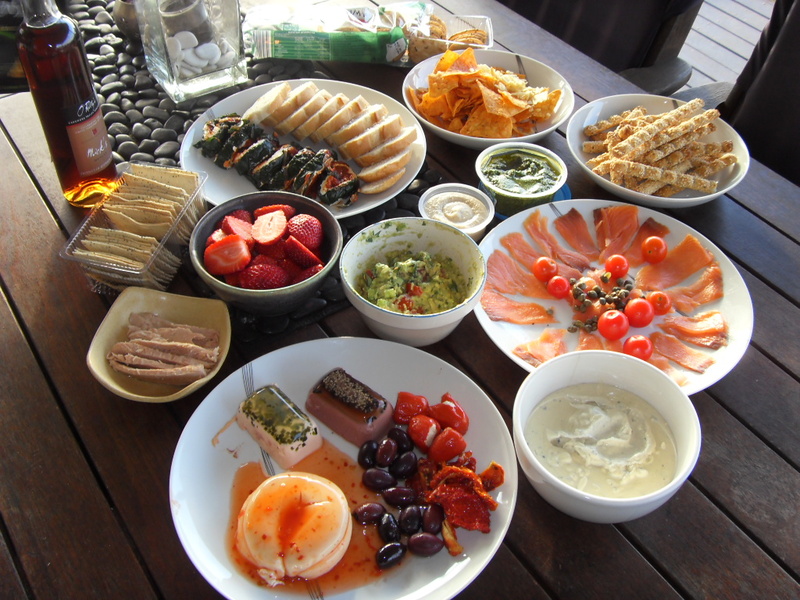 We had Blue Cheese Dip, Guacamole, Hommus, a Basil and Pinenut Dip, 2 types of Pate’s, Smoked Salmon and also all the different Crackers and Vegetables to go with it. Truly a divine array of colors placed on the table on the deck outside and we ate away with music playing in the background. And finally what was the other thing I prepared?? Shocking eh? But it was not my fault, I just had to keep an eye on those two, that I forgot my own work!